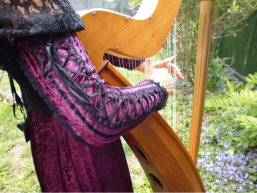 Harpist for Weddings and other Functions. 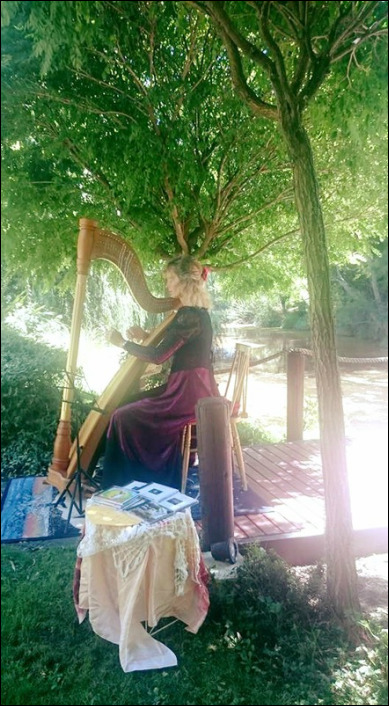 Annemieke Harmonie is a harpist for weddings, functions, and other occasions. She has many years of experience and played at weddings all over the world. The choice of music is yours; Annemieke can cater for Celtic, Classical, South American, Medieval, Victorian, Romantic, Christian songs, Cover Songs, Jewish, meditative music and much more. Annemieke with her Bohemian pedal harp performing at the long lunch at the Playhouse. 'Your presence created the perfect mood for our wedding. The comments about you and your music have been mind blowing, and I thank you most sincerely for your magical music.' Kate. I just wanted to let you know how impressed my guests were with your playing on Saturday. Everybody commented on how lovely the music was. ​'Absolutely love your CD. I managed to get part way through your first song before I started to bubble and then I was sobbing!!! I will need to play it all weekend to harden up before my wedding day where you will be playing live. Do you normally have that effect on people? Believe me, they are tears of happiness, not sadness.' Donna.